A distribution centre for the online retailer Amazon covering an area the size of 10 football pitches has been officially opened in Swansea Bay. The site in Jersey Marine is expected to create 1,200 full-time jobs over five years, and 1,500 seasonal jobs. First Minister Rhodri Morgan was at the opening and he called it a "powerful shot in the arm" for the Welsh economy. However, the Unite union has warned against Wales relying on service sector jobs. The project is in the Neath Port Talbot Council area and its planning involved the local authority and the Welsh Assembly Government. It was planned and completed in 16 months, from the first discussions to the opening. 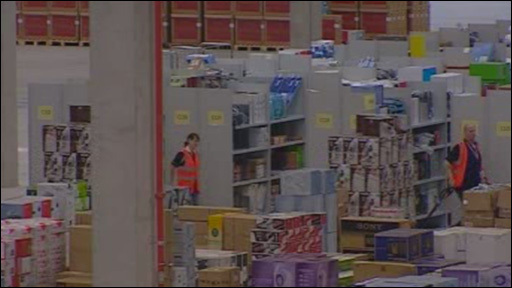 The warehouse is the company's fourth distribution centre in the UK and its largest. The others are in Glenrothes in Fife, Gourock in Inverclyde, and in Milton Keynes, Buckinghamshire. Many such warehouses are in the Midlands, and the decision by the company to locate to Swansea was seen as a coup for Wales, which has a growing distribution industry presence. More than 200,000 people are employed in the sector. Mr Morgan said: "The speed of delivery of this project has been exceptional. "It is an absolutely textbook example of how to do regional economic development. "Amazon is one of only a handful of truly world brands that have emerged since the internet changed the way we live our lives. "To have such a big name in e-commerce set up a major European base in Swansea Bay is an outstanding achievement for Wales." As well as the giant warehouse, a new access road has been built. "Partnership has been the key to this success and Team Wales looks forward to working closely with Amazon to ensure their on-going success and development in Wales," Mr Morgan added. However, the opening came a day after the 3M tape factory in nearby Gorseinon announced it was to shed 185 manufacturing jobs. Management at the plant, which opened in 1952, said redundancies were needed to remain competitive. The union Unite said it was concerned the manufacturing industry in Wales was "on the cusp of an irreversible tipping point". It expressed concern at the replacement of manufacturing jobs with what it called "insecure, low-paid employment in the service sector". "These jobs do not provide the foundations for young people to flourish and play a full and constructive role within their communities," a spokesman said.